Content. It’s everywhere. Be that success stories, social media snippets or in-depth blogs sharing technical know-how, content is becoming one of the most important things tech and digital companies can do to connect with their audience, build a community behind their brand and discover new customers and clients. But for many tech and digital companies, the idea of producing content can feel overwhelming. And with dozens of social media platforms, ways of producing content and means of sharing, it’s hard to know where to start. 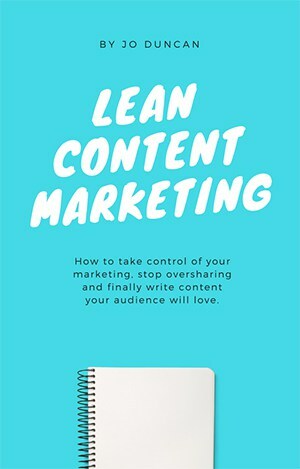 Tackling the region’s content catastrophes, Jo Duncan, a Bristol-based comedian and copywriter, founded the startup Lean Content and recently published a book ‘Lean Content Marketing’ (pictured right) to help entrepreneurs, marketers and small businesses find the perfect balance. Keen to get the insider story, we caught up with her to find out more about the inspiration behind the book and some of the benefits of a lean approach to content. TechSPARK: Can you tell us a bit about your background and how you got into content marketing? Jo Duncan: I never dreamed I’d become a marketer. I’m from a small village in Rutland and I was a teacher for ten years. I had friends who found careers in marketing and watched them in awe. The turning point came around 6 years ago when I had some articles published in the Guardian. At the time I was teaching History, but one day I decided to quit and just go for it. That was one of the scariest things I’ve ever done. Around that time I was doing more and more stand-up comedy, which I think gave me the confidence to be more outgoing and pursue my writing. As I got braver on stage, I felt braver about starting a new career and going after what I really wanted to do. Since then I’ve worked for some incredible agencies and worked client-side too. I’ve always loved writing more than anything else, so content marketing is a perfect fit for me. TS: So, in your opinion, why is content marketing so important for digital and tech businesses? JD: Content is a chance for all businesses to communicate what they know to their customers, and it’s that simplicity that I love. This sort of marketing is the best way to grow a tech or digital business. It’s better value for money than almost any paid type of advertising. It lets you grow an audience based on your expertise in what you do, and it lasts. One of my favourite quotes about content is that ‘it never sleeps.’ Whatever you’re doing, your content is out there being seen. It’s also one of the oldest forms of marketing. I think some people assume that content is a new idea, but it isn’t. Companies have been using clever, helpful ways to get their message out for centuries. 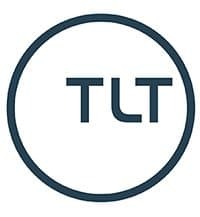 TS: Why did you set up Lean Content as a company and what are its aims? JD: I set up Lean Content after a talk I gave last year at Bath Digital Festival on lean marketing – doing more with less. I was overwhelmed by people’s reactions to the idea, so I turned the talk into a book and that became an idea for a business. The crux of it is that we’re a digital agency that promotes quality, affordable content, but we don’t encourage businesses to spread themselves too thinly, or waste time online with channels that won’t get them any return. TS: That’s great! And what are Lean Content’s biggest successes to date? JD: As a completely new company, I’ve been really surprised with the response we’ve received. We’ve already got clients, but it’s amazing to get enquiries from businesses of all shapes and sizes that are looking to improve their digital marketing. We’ve helped an online food retailer with a rebranding project, which had a clear digital focus, and that was fun. I’ve also been working with an immersive lighting company, and that too has been, er, illuminating. TS: Is there anything you know now that you wish you knew when you were setting up? JD: I have only really just got going, but I’m already learning the value of the Bristol networks out there to help businesses like mine meet more people. I’m amazed by the amount going on and it’s really helping me to spread my message. The one thing I wish I’d known would be probably around using CRM integration tools, because learning to use that has saved a huge amount of time. I also wish I’d known ten years ago that I could do this. I probably would’ve quit teaching sooner! TS: You’ve also recently launched a book ‘Lean Content Marketing’ – what is it about and how can it help businesses? JD: It’s a book that is designed to demystify digital marketing. It sets up a really simple philosophy for taking control of your marketing activities. The aim behind it was to enable smaller businesses to feel confident about picking and choosing where they spent their time, to maximise the return they get from online marketing. Marketing isn’t a mystical, dark art. It’s really very straightforward. And content marketing has been around for ages, in one form or another, so the book seeks to reassure and educate people about that. TS: What are the advantages of setting up Lean Content in Bristol? Bristol has a unique startup and tech scene that I love being part of. I get to work with and meet talented people because there’s so much happening to help businesses grow. The attitude city-wide is very entrepreneurial. I can’t think of anywhere I’d rather base myself than here. TS: Which other tech companies or people do you admire in the region? I’ve had a huge digital crush on Wriggle ever since I first used it to sell comedy tickets, I think the simplicity of the interface and the way Rob has used it to build relationships between local business and customers is extraordinary. I also think that Ultrahaptics is about the coolest thing imaginable. But I’ve worked in the past with other companies in Engine Shed and there’s truly loads of incredible tech companies and wonderful people out there. It’s brilliant to be surrounded by people that are doing really creative, innovative things. 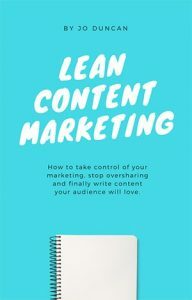 For some top content tips, download a copy of Jo’s book, Lean Content Marketing. Lean Content is also hosting a launch event at Floating Harbour studios, grab a ticket here. You can also stay tuned to Lean Content by following them on Twitter here: @LeanContent_.